As I’ve worked on some of these Oscar pieces, it has been rewarding to see the landscape of a year on film. Whether it is visiting films that have been mostly forgotten [but championed at the time] or filling in the gaps from recent years, there is something about cramming a dozen or so films from one year that boils it all down. In this particular case, 1943 was a very lackluster year for film. The 16th annual Academy Awards were held on March 2, 1944 and it is no big surprise that Casablanca was well represented. Unlike some classics of the time, Michael Curtiz’s romantic drama was just as beloved and respected as it is today. It received 8 nominations, including Most Outstanding Picture, Best Director and Best Actor, and won 3 awards, most notably Picture and Director. Surprisingly, though, it wasn’t the most represented film of the year—in fact, two films received more nominations: stoic religious drama The Song of Bernadette [12 nominations, 4 wins] and Hemingway adaptation For Whom the Bell Tolls [9 nominations]. Per usual, I’m going to focus only on the categories where Casablanca was nominated and only consider the films that received nominations. As you read through, the biggest hole you may notice is that Ingrid Bergman was not nominated for her iconic performance as Ilsa. How could that possible be? Well, Bergman was in fact nominated for Best Actress, but it was for For Whom the Bell Tolls. That’s all well and good, though that was absolutely the wrong call. In the end, though, the Best Actress winner Jennifer Jones in The Song of Bernadette was a rightful winner, so I guess it’s a wash.
You might also notice another strange occurrence: Casablanca actually debuted in 1942. Though it premiered at the end of the 1942, it didn’t receive a full theatrical release until 1943. If the theatrical system and Oscar rules had been more aligned with how it works today, I couldn’t imagine how we’d think about this slate of films today. We probably wouldn’t think of it at all. The Best Supporting Actor race proves to be one of the more difficult awards to hand out in a year where one film stood firmly above all others. All five nominees were strong working character actors of the time who got minimal acclaim related to the big studio stars at the time. As the industry and Academy have shifted to honor bigger stars who happen to take on smaller roles, it is nice to see these five particular actors squared off against each other. Combined, they served in 668 known credits. Aside from Naish, who is a tragic and unlikely hero in the war film Sahara, the other characters are all varying degrees of antagonists, at the very least foils, for the film’s stars. Bickford is a community priest who doubts the claims of visions but is willing to protect Bernadette from outside institutions more able to exploit her; Coburn is an impish old man who serves as matchmaker to stars Jean Arthur and Joel McCrea; Rains isn’t an outright villain, but is the intermediary between Casablanca’s heroes and the Nazis; Tamiroff is an ally to Gary Cooper’s rugged hero, though their philosophical and strategic spats offer much of the film’s tension. I’m particularly piqued by the nomination for Claude Rains, as Casablanca is so full of outstanding supporting performances. Personally, if I were to nominate just one of the actors from the film it would be Dooley Wilson, the least accomplished actor of the bunch, but his performance as Sam sticks with me the most emotionally [and his musical achievements in the film help, too]. I would consider Paul Henreid ahead of Rains, too. Rains having been previously nominated for Mr. Smith Goes to Washington likely helped his case here. Coburn was nominated three times in supporting roles, establishing his legacy as one of classic Hollywood’s great character actors. His work in The More the Merrier gives the film a lot of life—without his presence the early comedic plot line wouldn’t work, which in turn would damage the emotional romantic center that later takes hold. Ultimately, though, I’d choose Charles Bickford in a close race. I love the complexity of the performance, as Father Peyramale is both a villain and an ally, with Bickford constantly pulling from both sides. If he had hammed it up a bit too evil, the total balance of the film would have been off which would have greatly impacted the emotional journey of the title character. The Song of Bernadette is without a doubt Jennifer Jones’s film, but her performance wouldn’t have been so extraordinary if she wasn’t matched up with Bickford, and that’s a good sign of a great supporting performance. This might be a bit of a cheat, but the music in Casablanca is so important that I couldn’t really think of choosing anything else. Sure, the renditions of “As Time Goes By” isn’t what we’d consider a score [though the song is used effectively in the score throughout], it is the only piece of music in the bunch of nominees that has left a mark on cinema. As was the practice at the time, from the mid-30s to the mid-60s, the Best Cinematography award was split between two categories differentiated by black and white and color. Though that may seem like a trivial distinction not based on actual craft [especially as using black and white cinematography has become more of a stylistic choice than a camerawork choice], the way films were being shot were drastically different. For the most part, the color nominees tended to be either epics or some sort of fantasy [musicals, family films, genres that used the color as an indication of entertainment]—and so nominees like For Whom the Bell Tolls and winner Phantom of the Opera. As for these nominees, there are basically two camps: interior dramas and war films. While one would think the war films would have the advantage for their scope and inherently more visceral camerawork, the two most beautiful films are Casablanca and rightful winner The Song of Bernadette. One of the four wins for The Song of Bernadette, cinematography is a definite strength of the film. As a religious themed drama, the black and white photography helps create a needed atmosphere of austerity. If scope is important to you when considering the best cinematography, while much of it is an interior film, there are important landscapes, as well. More importantly, though, the cinematography matches the tone of the film by creating images that become very painterly and dramatically resonant. It is also exemplary for an underrated aspect of cinematography: lighting. The very way it lights Jennifer Jones as Bernadette helps build the character as tragic and fragile, which helps bolster her wonderful performance. Seemingly simple shots of her face in close-up became the indelible image in my mind as I watched through these films specifically with cinematography in mind. This category is fairly uninspiring. Unfortunately, I was unable to see Air Force as the Netflix DVD I received was cracked in two. Perhaps it would have been a more exciting choice. Or perhaps I’m unfairly looking for more modern editing techniques. In any case, Casablanca gets the nod over The Song of Bernadette for its brevity and efficiency. While The Song of Bernadette’s long run time has moments that inevitably drag, Casablanca is a well moving machine from start the finish. It isn’t flashy, but it runs smoothly. This is an interesting mix of nominees given their relative strengths of screenplay. The More the Merrier, for example, its best attribute is probably its screenplay, which is a nice mix of the screwball comedy gone by, the modern romantic comedy, and a character driven drama. For The Song of Bernadette, on the other hand, which is overall a better film than The More the Merrirer and was represented as such, the screenplay is one of its bigger flaws. These two particular films are even more interesting to pair given their extreme contrasts in what kind of story they are interested in telling. The More the Merrier, which is essentially a screwball comedy, is extremely plot heavy while The Song of Bernadette leaves more to tone and themes for the viewer to ponder. Both films juggle a myriad of characters and subplots [The Song of Bernadette’s nearly three hours almost dictates it] while ultimately sustaining good storytelling, signs of a good screenplay. But are either The More the Merrier or The Song of Bernadette particularly memorable or [one way to think of a great screenplay] quotable? 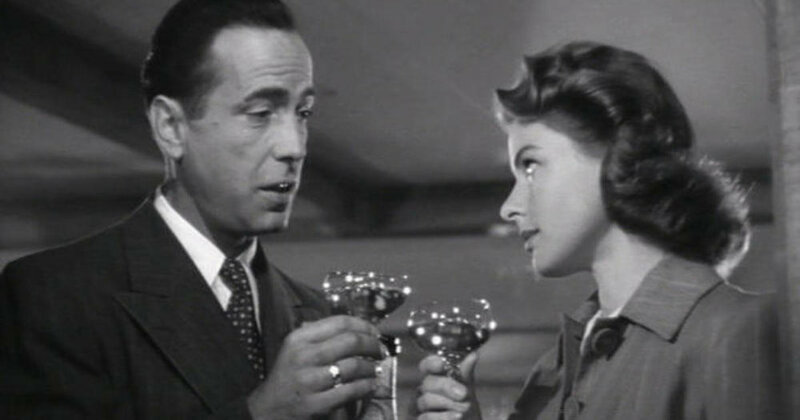 “Here’s looking at you, kid,” “We’ll always have Paris,” “Of all the gin joints…” Few movies have become as quoted as Casablanca. The story has become timeless for Hollywood, the characters iconic, their dialogue forever remembered. So while the nominees may be worth of their praise, there is only one choice that makes any sense here. Usually of all the various categories, Best Actor is among the most difficult to pick. No matter the year, you can look back and usually see five noteworthy performances from some of the best actors in cinema history. Even this year you have Bogart, Cooper and Rooney, who would all be considered in the actor pantheon, with Pidgeon less remembered today but certainly important in the era. For whatever reason, though, this is a particularly weak year. One caveat: The Human Comedy isn’t an easy film to find, so I have no opinion on Mickey Rooney’s performance—maybe he was what this competition really needed. I can understand why the Academy chose Paul Lukas as Best Actor—he was a respected working actor with almost 30 years in the business who had never really received any recognition before. As the anti-fascist trying to protect and provide for his family, it is a meaty role. Lukas plays it with strength and grace as a figure that deserves our reverence. There isn’t much range there, though, and so it isn’t my favorite or the most memorable performance among the group of nominees. For the second straight year, Walter Pidgeon was nominated for Best Actor while being completely overshadowed by his co-star Greer Garson. While their previous work Mrs. Miniver is a better work overall, Pidgeon gets a bit more to do in Madame Curie. As Pierre Curie, Pidgeon goes for the awkward and lonely aspects of the famous scientist which works within the semi-comic romance at the heart of the film. That said, I’ve come to realize that Pidgeon’s acting style is a bit too theatrical, lacking the subtleties that a camera is meant to pick up. I mentioned in my Opening Statement that Rick isn’t my favorite Bogart performance, but given the competition, I think he’s the right pick here. Again, this has a lot to do with the enduring status of Casablanca and certainly Bogart has something to do with that. This was the first Best Director nomination for George Stevens who would later win the award twice for A Place in the Sun and Giant. Despite being a five-time Oscar nominee, I’m not sure that he is quite as remembered as some of his contemporaries. He made some beloved films, most particularly Shane, but it seems like his work as a director hasn’t translated over the years with the reputation of his films. For The More the Merrier, this seems like a modest output considering the epic dramas he would later make. Ernst Lubitsch was nominated three times for Best Director, with his nod for Heaven Can Wait his last. The film involves the death of a businessman who recounts his life to “His Excellency” in order to be admitted to hell. This promisingly dark premise is given the trademark “Lubitsch touch” and transformed into a light, high society comedic drama. It is a shame that Lubitsch never won an Oscar [he was given an honorary Oscar in 1947 a few months before he died], but Heaven Can’t Wait wasn’t his most deserving—unfortunately, his best case in 1940 for Ninotchka wasn’t nominated because Fleming, Capra, Ford, Wyler, and Wood were [that’s some tough competition]. Like many of the awards, this is largely a pick between Casablanca and The Song of Bernadette. In any year, both men would be strong nominees but rarely contenders. Curtiz gets the edge, in part for historical reasons [he had been nominated three times earlier without a win, while Henry King is much less notable]. Casablanca is more a workman-like film than The Song of Bernadette, but Curtiz’s direction, especially of the large cast of actors, keeps the film humming along. Easiest decision ever? From a historical perspective, taking a glance at the list of films you see an all-timer in Casablanca and then a list of mostly forgotten films. I still had to do my due diligence to make sure there wasn’t some sort of hidden gem in here that would blow me away. Even as I’m not the world’s biggest Casablanca fan, any other choice would be pure contrarianism. Given its 12 nominations and 4 Oscar wins, The Song of Bernadette could be easily seen as Casablanca’s biggest competition. And, certainly, it is the stand out from the rest of the pack. It is a slow, thorough, quiet drama that Hollywood doesn’t really make anymore [which may be part of the reason it hasn’t really been remembered, either]. A very strong cast is anchored by Oscar winner Jennifer Jones, who is fantastic as the title girl who is visited by a spiritual vision and stays strong despite community backlash. As for the rest of the nominees, nothing really stands out. For Whom the Bells Tolls is long and boring. Madame Curie delivers another fine performance from Greer Garson, but hasn’t aged well as a very standard biopic. Heaven Can Wait has a fun conceit, but doesn’t transcend its set-up. Watch on the Rhine is resonant today for its anti-fascist messages, but is dramatically uneven. The More the Merrier is a solid piece of entertainment, but Best Picture? In Which We Serve is notable as the only feature film directed by famed playwright Noel Coward and it has an interesting, though pretty thing, documentary style. With all that considered, it’s Casablanca. Overall, the filmed picked up three more Academy Awards, bringing its total count to 6. Somehow, that still seems light given the year in film.